Energy policies cannot fulfil their maximum potential if the knowledge stemming from social sciences and humanities research is not factored into the decision-making process. Citizens should be at the core of all policies – including those to do with energy. This conference will underline how crucial social data is to accelerating the decarbonisation of our economy and making a real dent in climate change. It will also present concrete recommendations on how to advance and better design future European energy policies in the context of the upcoming research and innovation framework; Horizon Europe. The event is organised as part of the SHAPE ENERGY H2020 EU-funded project. It aims at generating new knowledge, support evidence-based policymaking, produce interdisciplinary solutions and develop Europe’s expertise in using and applying available research into the energy transition decision-making process. Should you not be able to view this gallery, please click here. After 20 years of negotiations, 195 countries signed the Paris Agreement to limit global warming well below 2°C above pre-industrial level by the end of the century. The focus now moves to design and implementation, and success will depend on the support and contribution of all – including industries, member-states, regions, cities and citizens. While social science and humanities’ (SSH) research has played less of a role to date in shaping European energy policy than Science, Technology, Engineering and Mathematics (STEM), understanding the human and social implications of energy systems – such as behaviour and consumption patterns - play a critical role in ensuring the best possible social acceptability and impact. Learning, experience and research demonstrates that mainstreaming these disciplines into energy policies, and ensuring a citizen focus, are crucial components to accelerating the decarbonisation of our economy and tackling climate change. The SHAPE ENERGY project, through its multi-stakeholder undertakings and wide geographical scope, has worked to generate new knowledge, support evidence-based policymaking, produce interdisciplinary solutions and develop Europe’s expertise in using and applying available research into the energy transition decision-making process to fill current gaps and challenges. What is the business case for making better use of social sciences and humanities research for the energy transition? What do the research and evidence tell us about integrating social sciences and humanities into the designing process of future policies? 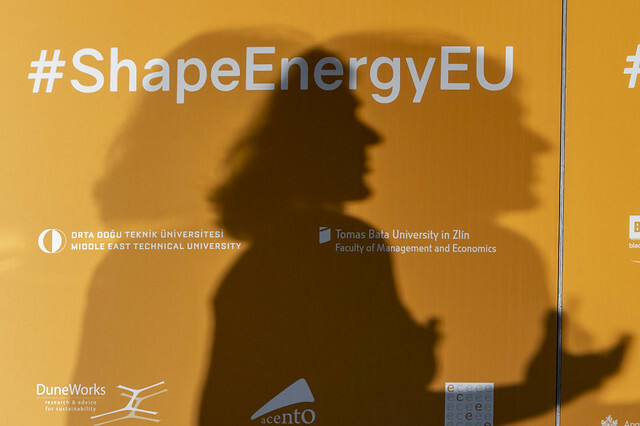 What are the outcomes from SHAPE ENERGY and how can they be translated into recommendations for Horizon Europe? Cities account for about 75% of global greenhouse gas emissions. It is clear, therefore, that cities are ideal for convening multiple actors and brokering experimental transformative measures that can successfully engage society in a low-carbon economy. This can lead to improving the understanding of environmental behaviours which can help tackle emissions from intensive sectors such as transportation and buildings. For systemic change to take place, all sectors must be involved and existing urban models, including governance, will need to be adaptive and flexible. Mainstreaming research into policy thinking and development can enable a far more comprehensive dialogue between researchers, policy workers and citizens, as well as produce vital insights for consumption and behavioural patterns to change. How can a more collaborative approach ensure we address real world questions, accelerate decarbonisation, and deliver real impact in cities and beyond? How can social sciences and humanities research in energy intensive sectors such as transportation and construction help influence consumption patterns? How can social sciences and humanities research influence decision-making and accelerate energy transition in cities? Research and innovation are key drivers of a knowledge-based society, improving productivity and economic growth, including new job opportunities. Europe spent close to €80 billion on the Horizon 2020 Research and Innovation Framework Programme. Despite a future cut in the EU budget following Brexit, research spending is expected to increase by about one fifth for Horizon Europe. This increase is expected to create 420.000 jobs by 2040 according to the European Commission. To address the current climate crisis and boost Europe’s competitiveness, the EU must use its funding wisely to understand the implications of social sciences and humanities research in its agenda to accelerate action on climate change. With additional funding directed to high-quality proposals involving social sciences and humanities, Europe’s leadership in climate action and the energy transition could be achieved. How should the budget for future energy research reinforce Europe’s long-term strategy to reach its climate and energy ambition? How can we better align research, funding and policies for greater impact? What should the next EU mandate do to ensure that the link between budget and research is better aligned with climate change action, which is one of the major concerns of citizens? A number of H2020 funded projects coming from across Europe and representing various energy-related topics including PROSEU; INNOPATHS and the EU Energy Poverty Observatory among others will share their journeys and key takeaways. This will allow for an interactive exchange where each individual project will have the opportunity to present and answer questions from the audience, enabling all H2020 projects to learn from each other. 30 minute short conversations with members of the SHAPE ENERGY consortium run in parallel on issues that matter to them, to gain expertise from this resourceful project and network. Simone Abram is a professor at the Anthropology Department of Durham University with a specialty in ethnographic fieldwork, particularly in the UK, France and Scandinavia. As Co-Director of DEI, she works to bring together researchers from Durham University’s Science, Social Science and Humanities Departments to produce cutting-edge energy research. As a researcher at the National Centre for Energy Systems Integration (CESI), Abram strives for the incorporation of a societal perspective in the energy system. She also co-founded the Energy Anthropology Network (EAN), which brings together anthropologists working on energy questions. In addition to that, she is a member of the European Platform for Energy Research in the Socio-economic Nexus (PERSON). Aziza Akhmouch is the Acting Head of the Cities, Urban Policies and Sustainable Development division within the OECD Centre for Entrepreneurship, SMEs, Regions and Cities. She oversees wide-ranging, thematic work related to transport, housing, smart/green/circular cities, spatial planning, urban financing, metropolitan governance, water governance, cities and climate change. In this role, she advises governments on how to design and better implement the urban policies that have the potential to lead to more fulfilled lives. Her portfolio also includes metropolitan and national urban policy reviews that assess the performance of cities and countries and provide tailored recommendations for their improvement. In addition to these responsibilities, she also oversees the OECD roundtable of Mayors and Ministers. As Deputy Director-General for Research and Innovation, Patrick Child works to support the EU’s role as a leader in the green technology transition by ensuring it supports public and private investment in clean energy technologies. He also chairs the Steering Committee of Mission Innovation, a global initiative consisting of 23 countries working together to dramatically accelerate clean energy innovation through reinforced international commitment. Child is also responsible for the coordination of the EU’s Horizon 2020 research and innovation budget. Stephen Cook is an energy consultant and chartered town planner with over two decades of experience in planning, energy, and urban development. Cook is a leader in the Energy and Climate Change consulting practice at Arup, a leading design firm best known for its work in the built environment. Cook’s work lies at the interface between planning and infrastructure for resilient, low-carbon cities. At Arup, he has worked on a wide range of assignments, including energy masterplans, carbon reduction scenario modelling, smart cities and carbon and energy policy advice. Chris Foulds is Principal Research Fellow at the Global Sustainability Institute, Anglia Ruskin University (Cambridge, UK), and co-lead of the SHAPE ENERGY Platform and upcoming H2020 Energy-SHIFTS Forum. Foulds researches how society and everyday life intersect with energy policies, governance, consumption, and the built environment. He was previously the Principal Investigator of the EU COSME Energy in Water project. Currently, Foulds is Co-Investigator of the H2020 Responsible Research &amp; Innovation Networking Globally project, where he leads a global review concerning the current state-of-the-art on e.g. energy-related innovation. Derk Loorbach is a professor of Socio-economic Transitions at Erasmus University Rotterdam. He began his career as a researcher at the International Centre for Integrative Studies (ICIS) of Maastricht University and has been working on sustainable transitions, transition management and governance since 2001. Loorbach is seen as one of the founders of the transition management concept; a form of governance for sustainable development that incorporates complex systems thinking. He has published extensively on the subject and has been involved in numerous transition projects, uniting government, business players, civil society and science. Florent Marcellesi has been a Member of the European Parliament for the Spanish Green party EQUO since 2016 and was previously spokesperson for the party. He is currently a member of the Committee on Women's Rights and Gender Equality and the Vice-President of the European Forum for Renewable Energy Sources (EUFORES). In addition to this, he serves as a member of the think tank Ecología Politica and has authored titles such as “Which Europe do we want?”. He was trained as a civil engineer and urban planner, and is a specialist in international cooperation. Renata Mele serves as Head of Strategy for E-City at Enel X, the Global Business Line of the Enel Group dedicated to the creation of innovative energy solutions, operating in more than 20 countries. Within E-City, the product line focused on providing energy and digital services for cities and public stakeholders, she manages the strategy and product portfolio at global level. Formerly, Mele held the position of Deputy Director at the Enel Foundation, the research and study centre created by Enel Group, where she was instrumental in carrying out the Foundations's research ambitions, in addition to promoting executive training and dissemination initiatives focusing on the thematic areas on energy, socio-economics, sustainable development and innovation. At the Enel Foundation, she led cross-disciplinary international research programs on Sustainable Urban Development. Rosie Robison is Principal Research Fellow at the Global Sustainability Institute, Anglia Ruskin University (Cambridge, UK), and co-lead of the SHAPE ENERGY Platform and upcoming H2020 Energy-SHIFTS Forum. Rosie researches sustainable lifestyles and journeys of change towards lower consumption. Having led several interdisciplinary networks, she explores how different communities can work together as well as constructively disagree. Rosie was Principal Investigator of the EPSRC Balance Network, exploring smart technologies. In addition to that, Rosie was a UK Parliamentary Office of Science and Technology Fellow, focusing on electric vehicle policy. Xavier Troussard is Acting Director of the “Competences” Directorate at the Joint Research Centre, in addition to occupying the role of Head of the “Foresight, behavioural insights and design for Policy” Unit in the same Directorate. The mission of this Unit is to support policymaking at EU level, taking into account the insights from anticipation disciplines (horizon scanning, foresight), behavioural sciences and design thinking. Joining the Commission in 1989 at the DG for Information, Communication, Culture and Audio-visual, he represented the European Commission in the negotiation of the 2005 UNESCO Convention on the protection and promotion of the diversity of cultural expression, managed programmes, developed policies for the culture and creative industries and contributed to the shaping of the EU Creative Europe Programme. Kathleen Van Brempt is a Member of the European Parliament for the Belgian social democratic sp.a party. She is the Vice-President responsible for sustainable development of the Socialist and Democrats Group Bureau. Van Brempt has served as the Chair of the European Parliament’s Committee of Inquiry into Emission Measurements in the Automotive Sector (EMIS). She was also State Secretary for Labour Organisation and Welfare in the Belgian federal government and Minister for Mobility, Social Economy and Equal Opportunities in the Flemish government. Additionally, Van Brempt is a member of the city council of her hometown Antwerp, in Belgium. This conference is overbooked and we are no longer able to accept new registrations. A report will be available shortly. In the meantime you may follow live tweets @friendsofeurope and #ShapeEnergyEU.